Aside from burgers, the US is traditionally a grain-fed beef consumer. However, Australian grass-fed meat exports to the US have slowly been increasing over the past few years. Where and how is this beef consumed in the US and what are the drivers behind this? More importantly, is it a fad, or will the trend continue? How could Australian product differentiate itself to stay ahead of the game and maintain a strong presence in the US? Australian livestock production accounts for approximately 50% of our total agricultural production value. As of 2017-18 livestock production was valued at $31.2 billion with ABARES stating this as a 4.5% increase in livestock production off the back of 2016/17. With a national cattle herd size of 25 million head (MLA), Australia produces approximately 4% of global beef supply, coming in at the later end of the top 10 producing countries. 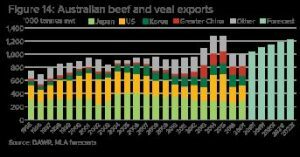 Despite this, Australia is the 3rd largest exporting country, with over 50% of our beef products entering Japan (29%), US (22%), and Korea (17%) as of 2016/17 (MLA). Australia produces just over 2 million tonnes carcase weight (cwt) of beef, with 68% of this sent into export markets. This contributes 15% to global beef exports, representing a gross value of over $7 billion, which the ABARES suggests has increased heading into 2018. Australia has a population of just over 24 million with a national herd size of 25 million head. The United States of America facilitate a larger population of approximately 325 million. Inherently, due to this substantial population size, the US manage a larger national beef herd of some 95 million head and growing. The USDA reports the US is currently in a herd rebuild phase, with cattle numbers increasing to 95 million head in 2017 and it projected to steadily grow in coming years. This is off the back of a significant fall in cattle numbers in 2014 and 2015. The United States is Australia’s second largest export market utilising 22% of our total exports (or 234,112 tonnes shipped weight (swt) in 2016/17). However, total Australian beef exports to the US has seen a 22% decrease when compared to the 5-year average. This is supported with MLA stating a 30% decrease in frozen beef exports to the US in 2017 compared to the 5-year average. Despite this reduction in total beef exported to the US there has been interesting growth in chilled beef sector. Australia has increased chilled beef exports to the US by over 5% over the past 5 years. Of this chilled grass-fed beef has seen a 15% increase in market share from 21,000 tonnes swt in 2010 to 58,000 tonnes (swt) in 2017 (MLA). Grass-fed beef exports (frozen and chilled) to the US account for close to 97% of total beef exports and has been maintaining a steady increase over 2017-2018 (MLA). Increasingly, consumers are becoming more aware of the negative health and animal welfare connotations around grain finished beef. This is the driving force behind the increased demand for grass-fed beef products. With grass finished beef only accounting for 3% of total US beef supply (Romig, 2013), this developing niche market presents significant market opportunities for Australian beef, in which over 60% of cattle slaughtered are grass finished. Current beef exports to the US account for 22% of total Australian beef production. A massive 63% of this is manufacturing beef used in the production of ground beef and processed meats. The majority of manufactured beef enters the food service sector, while MLA suggests the majority of our premium value grass-fed muscle cuts enters retail chains and high-end full service restaurants. This is predominantly represented by full loin sets, which represent a 9% share of all muscle cuts sent to the US. Recently, this muscle cut has seen explosive growth with an increase volume exported of close to 14,000 tonnes (swt) from 2016 to 2017. Upon comparison of 2017 to the 5-year average, there has been a 1490% increase by export volume, currently sitting at 20,835 tonnes (MLA). With the Australian product renowned for its high quality, this strong increase in export volume represents a high value market for Australia. The US grass-fed beef market represents a value of $363 million in 2016, up from $22.6 million in 2012 (Stone Barns Report, 2017). In conjunction with (Umberger, 2002) suggesting 23% of consumers were willing to pay a premium for grass-fed products, gives in certainty for further expansion potential into the US market. A “Natural”, “Healthy”, and “Environmental Sustainable product”, are just some of the perceived factors leading to increased consumer demand for grass-fed beef globally (Sitienei, 2016). Consumption of grass-fed beef has seen rapid growth in recent years, based upon growing consumer concerns around how their food is produced. (Stone Barns Report, 2017) indicates that grass-fed beef generated $272 million in retail in 2016, this is up from $17million in 2012. The environmental sustainability of grass-fed systems relates to the utilisation of certain soil types and climates. With the production of cereals and grains for human and animal consumption requiring fertile soils, grass-fed beef production systems are capable of operating on grass rangelands that have minimal cropping potential. This method of beef production is capable of utilising human inedible plant material with ruminants converting it into a highly nutritious source of protein for human consumption. Red meat is a nutritionally dense product that contains all the essential amino acids, with vitamins and minerals, such as Vitamin B, iron and zinc. 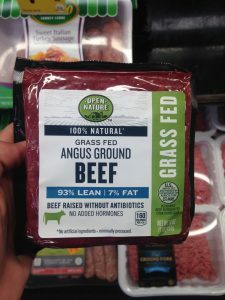 Grass-fed beef contains a higher content of omega-3 fatty acids and lower levels of saturated fatty acids than conventional grain-fed beef (Daley et al, 2010). This can have consumer health benefits with (Romig, 2013) stating that the lower concentrations of saturated fatty acids and higher omega-3 fatty acids composition in grass-fed beef, compared to grain-fed beef, can result in a lower prevalence of heart disease and improvements in blood circulation. The Pasture fed Cattle Accreditation Scheme (PCAS) is a program that provides pasture finished beef certificates to Australian producers. Producers that produce pasture fed or finished beef have met standards including; lifetime traceability, lifetime on pasture, no confinement for intensive production, free of antibiotics, no hormone growth promotant and MSA compliant. While PCAS is not formally recognised internationally it is important in ensuring high transparency for consumers between natural and pasture-finished beef. Future for Australian Grass-fed Sector and exports to the US? Australian grass fed beef has many threats and opportunities in the US market, that can be overcome and capitalised on to maintain and expand market presence. The Australian-US Free Trade Agreement (AUSFTA) was established in 2005 and allows Australia to export a total quota of 423,214 tonnes (swt) to the US. This quota is well and truly more than we are currently capable of exporting, but applies tariffs of 17.6% to beef supplied over this quota. MLA, states that this quota will be expanded up to just under 450,000 tonnes (swt) and quota tariffs abolished by 2022. This provides significant opportunity for expansion into the US market, specifically into the emerging chilled grass-fed beef sector. 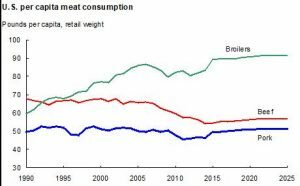 With speculated increases in Australian beef exports by 21% over the next 5 years up to 2022 (MLA) and USDA’s proposed steady increases in US consumer consumption into the foreseeable future, prompts the continuation of Australian product presence in the US. The projected increases in production are on the account of increasing herd numbers, slaughter kill and average carcase weight increases by 2022 (MLA). Meat Standards Australia (MSA), is a beef eating quality grading system that was established in 1998, providing consumers with accurate prediction of eating quality for specific beef cuts. The diverse nature of Australian grass fed beef production means that many factors (both pre-slaughter and carcass traits) that influence eating quality in beef, which must be accounted for to ensure consumers are given a consistent product. Product visibility and labelling of our product in predominately US supermarkets causes challenges for product differentiation. With Australian beef being renowned for its traceability and production of high quality beef, it’s imperative that our product is easily differentiated from foreign grass-fed beef. Moving forward, enhancements of product labelling may help promote the provenance behind the beef that consumers are purchasing. 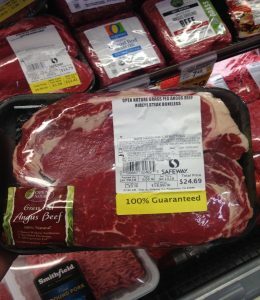 Such issues are represented by Figure 3 and 4, illustrating Australian grass-fed beef in a US supermarket with the only reference to Australian beef on the back in fine print “produced and harvested in Australia”. Australia has established a firm presence in the US market. With predicted increases in Australian beef production and consumption in the foreseeable future, there is confidence in our presence in the US market, in particular with expansion possibilities into the chilled grass-fed beef sector. MLA, (2016-17). MSA, Annual Outcomes Report. MLA, (2017). Market Snapshot 2018; North America. MLA, (2017). Australian Cattle Industry Projections for 2018. MLA, (2017). MSA: Australian Beef Eating Quality Insights 2017. USDA, (2016). US Livestock Industry Projections. Romig, K. (2013). Impetus for grass–fed beef production in the beef belt. Geographical Review, 103(1), 112-120.
profiles and antioxidant content in grass-fed and grain-fed beef. Nutrition journal, 9(1), 10. MLA, (2009). 2020 vision for the australian feedlot industry. MLA, (2017). Market Supplier Snapshot: US beef industry. Umberger, W. J., Feuz, D. M., Calkins, C. R., & Killinger‐Mann, K. (2002). US consumer preference and willingness‐to‐pay for domestic corn‐fed beef versus international grass‐fed beef measured through an experimental auction. Agribusiness, 18(4), 491-504. Sitienei, I., Gillespie, J., & Scaglia, G. (2016). Goal Structure of US Grass-Fed Beef Producers. In 2016 Annual Meeting, February 6-9, 2016, San Antonio, Texas (No. 229565). Southern Agricultural Economics Association. NCBA, (2008). Understanding the different kinds of beef in the marketplace. Stone Barns Report, (2017). Back to grass: The market potential for U.S grassfed beef. Umberger, W., Feuz, D. M., Calkins, C., & Killinger-Mann, K. (2002). U.S. consumer preference and willingness-to-pay for domestic corn-fed beef versus international grass-fed beef measured through an experimental auction.